Alkaline Ionizer Purifier Energizer by AOK Health is a non-electric, filter-only device which creates really clean, good-tasting energized drinking water! 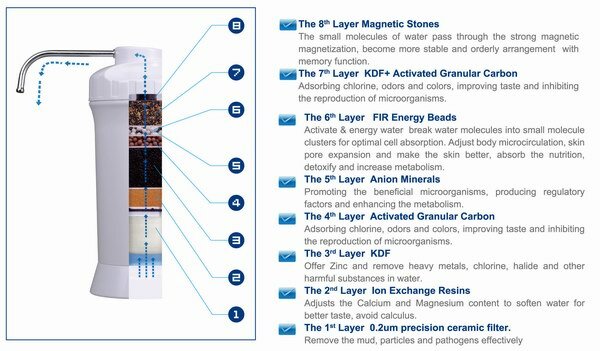 The Alkaline Ionizer Purifier Energizer by AOK Health contains 8 layers of filtration which purify the tap water, remove the bacteria, eliminate the chlorine, heavy metals, TDS, copper, iron, pesticides, a plethora of volatile organic compounds and fluoride, alkalize the water and give it a good ORP [antioxidants] as well! 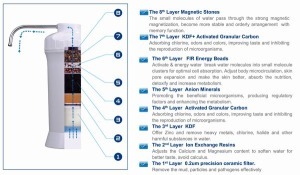 AOK Health's Alkaline Ionizer Purifier Energizer is Water Quality Association, NSF & FDA approved. This is the replacement filter for the Alkaline Ionizer Purifier Energizer by AOK Health. The filter lasts 1,000 gallons. It doesn't have a filter-counter, but the average family will need to change the filter every 6-9 months. We suggest you get a filter-counter so you always know exactly when to change it. Note: No instructions actually will come with the replacement filter,s so come back to this page when you get it to follow the step-by-step instructions designed to make your replacement filter installation a breeze. Do not disconnect from water supply, but have it turned off for now. Remove the chrome spout and set it aside carefully (it is breakable). Use the large filter housing wrench that comes with the machine to loosen the top piece. Remove the cap (smaller top piece). You will now see the top of the old filter. Now turn on the water supply full blast, with your finger over the hole at the top. (this should put pressure under the filter to un-seat itself from the housing. When the filter un-seats, pull it up and out using the ring at the top of the filter. Carefully remove the replacement filter from it's protective box. The ceramic on the AOK filter is breakable, especially once the wrapping is removed. Use the greatest care while handling it. After unpacking the new filter put a drop of vegetable oil on your finger and lightly coat the outer surface of the O-ring. Doing this will reduce friction while inserting the new filter into place. Warning: Use care to not to force or jostle the new filter while inserting it into the housing. With the oil applied, it should not have too much friction, so should slide into place with slow, even, careful pressure down on it until it slides into place, flush with the housing. It is in a delicate state until you fill the unit with water, so continue to use care throughout the entire changing process. With the new filter in place; place the smaller cap on where it goes; place the larger cap on and tighten (don't over-tighten); and re-insert the spout. Now that the new filter is installed, you should turn on the water flow. Note: it will take a while to go through the new filter. The water will be dark grey for a short while. This is from carbon dust that forms from friction in the filter packing process. Once the water comes out clear stop the flow of water. Wait about 20 minutes for the time-release magnesium to soften up enough to ionize, and you're good to go.